Just about everyone I know loves to hear love stories and love songs. 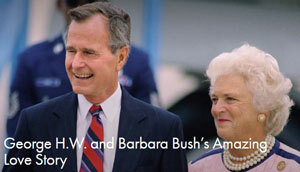 The recent deaths of George and Barbara Bush gave us the opportunity to reflect on their long standing love for one another–the love of a couple married and devoted to each another for seventy-three years, supporting one another through both the good and the tragic, like the death of one of their daughter at age three. Barbara Bush said that when their daughter died, “George held me tight and wouldn’t let me go. You know, 70% of the people who lose children divorce because one doesn’t talk to the other. George didn’t allow that. This human love story points toward the love story of God, and the love that God has for you, and for me. God holds us tight, and will not let us go, no matter what. Because God talks with us and tells us. God says so, in today’s reading from Isaiah. Listen to God’s words for you. Try to lay down whatever is on your mind right now. Get quiet inside so that you can hear God speaking to you. And if you’re still distracted that’s ok. Just try to open your heart to God in prayer. Listen, and you can hear God singing you a love song. because you are precious in my sight, and honored, and I love you. God holds us tight, and will never let us go. In his book, Aging as a Spiritual Practice, Lewis Richmond tells about what happened when he was diagnosed with cancer at age 36. He went through long months of treatment, felt terrible, and ended up with a case of depression. And as time passed, and he kept saying this over and over, and had nearly fallen asleep, he heard a new voice come to him. “I love you,” the voice said. Lewis started to cry. He felt tremendous relief. The world had shifted under his feet. One minute, he said, he was watching his life slip away, and the next, he felt his life returning to him. He had hit bottom and was on the way back. God was holding Lewis tight, and would not let him go. I felt God’s embrace this summer, alone in a strange place. The first Friday I spent in Antigua was perfect—studying with my teacher on a mountaintop, with volcanos towering around us, and then after a wonderful lunch, I spent the afternoon in the photogenic and evocative ruins of a convent back in town. And then I started walking home. I chose to go down the street parallel to my street—I knew I could cut over on a cross street, but unbeknownst to me, I missed the last cross street. Before I knew it, I had walked straight out of town, into unfamiliar territory, and I was lost, at dusk, in a strange place, walking and walking, clearly a lost tourist walking where tourists do not usually go, first along a deserted path along which strangers passed on bicycles, and then through parts of town not included in the tourist areas. I didn’t speak the language well, and I had no way to call for help because I had no cell phone. I felt as if the very walls along the streets were watching me. Was I scared? Yes! So scared, in fact, that I totally forgot that I had a map with me that I could have consulted and figured out my way back home. As I tried to push away the rising sense of panic threatening to overwhelm me, as I tried to quiet myself as I walked, I started feeling these words. God was holding me tight, and I knew that God would not let me go. So I kept on walking, trusting that God’s embrace would keep me safe. When I got home, darkness had fallen. The stars were out. Thank you, God, for holding me tight. We know very little about the early life of Jesus. Matthew tells us about the flight into Egypt and at last, the return of the Holy Family to Nazareth. Luke tells us about Jesus at age twelve staying behind in the temple when his parents headed home after the Passover, and then they couldn’t find him in the crowd, much to their dismay. When they found him, they held him tight. Otherwise, we know nothing about those years. And then when Jesus was about thirty years old, he appears in scripture on the riverbank of the Jordan River and gets baptized. After his baptism, Jesus was praying. While he was quiet, his heart open to God in prayer, the words came, in a voice from heaven. Jesus, being the faithful Jew that he was, may have heard in God’s words, the words God had sung in Isaiah echoing around him as well. God was holding his Son, Jesus, tight, that day on the riverbank. And some of us have chosen to follow, because we have at least heard that we are Beloved, and we desperately want to believe that. So we choose to be baptized, or to grow intentionally into our baptisms if we are baptized as infants, so that we too can rest in God’s embrace; so that we, too, can love one another, even if imperfectly, and find our way safely home when we are lost and alone. But even we, the baptized and the Beloved, get lost and discouraged because of the hardships that happen in this life—mistakes on our part, fractured relationships, unwelcome sicknesses, and aging and the spectre of death. Even we, the Beloved, forget that God is holding us tight. Sometimes we can’t feel God embracing us. We’re too depressed to sit in prayer, or we convince ourselves that we lack the time to sit in God’s embrace and to open our hearts to God in prayer because we’re too busy trying to fix what are often unfixable situations, or we just get depressed and give up hope. Sometimes we can’t feel God embracing us because we’ve been led to believe in our own power and self-sufficiency. We believe that we have the strength, the wisdom and the understanding to, on our own, negotiate the tough times in our lives. Sometimes we actively resist God’s embrace, like a small child throwing a tantrum and trying to struggle out of the parent’s loving, restraining arms. “Let me go!” “I hate you!” the child yells, and still, the parent holds on until the child finally rests, exhausted and safe, in that loving embrace. These challenges happen to all of us and threaten to defeat us more often than we’d like to admit. So the next time you find yourself crying out, “I hate this!”, the next time you’re lost, the next time you feel hopeless, go sit with Jesus on the riverbank after his baptism. Sit on that muddy riverbank. Pray as you sit there with Jesus and listen for the love song that God has been singing to all of us, throughout time. Then, feel the loving arms of Jesus wrap around you. No matter what happens, Jesus will hold you tight, and will never, ever let you go. Richmond, Lewis. 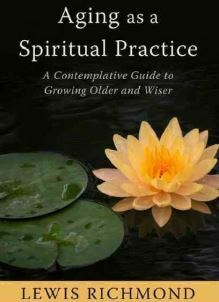 Aging as a Spiritual Practice: A Contemplative Guide to Growing Older and Wiser. New York, New York: Gotham Books, 2012.